Melinda Gates met with Dutch Minister for Foreign Trade and Development Cooperation, Sigrid Kaag, for a lunch meeting in The Hague on 16 November 2017. 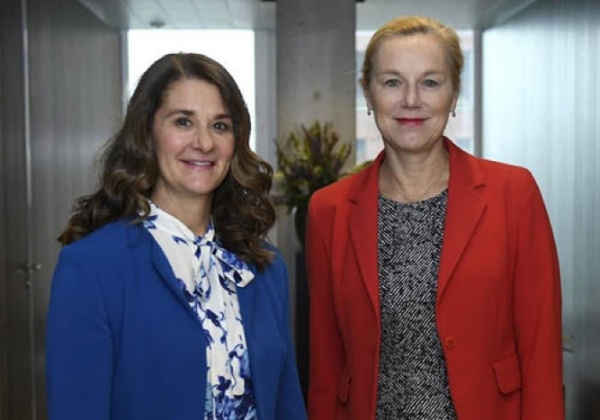 Gates and Kaag discussed joint efforts to support the 2030 Agenda for Sustainable Development. They specifically underlined the need to join forces on strengthening women’s rights and gender equality in developing countries. The Access to Seeds Index is an initiative that is supported by both the Bill & Melinda Gates Foundation and the Ministry of Foreign Affairs of the Netherlands. It evaluates the efforts of seed companies to support smallholder farmer productivity through improving access to quality seeds. The index pays special attention to activities by seed companies focusing on women farmers. For instance, seed companies are encouraged to include preferences voiced by women farmers to inform their breeding programs. Companies are also encouraged to reach women farmers with training programs, which can be increased by hiring female technical staff. As an example, the 2016 Regional Index for Eastern Africa found that the Ugandan seed company, Victoria Seeds, provides tailored extension services for women farmers to increase their production, crop output and income levels. As of 2016, more than 2,800 women in Uganda have been reached and trained in seed production and business skills. Other companies reporting programs explicitly focusing on women farmers’ training needs are Rijk Zwaan in Guatemala, Syngenta in Bangladesh, East-West Seed in Ethiopia, Myanmar and Vietnam and Seed Co in Kenya.